A hearty, flavorful, comforting Mexican-inspired dish...probably better known as tamale pie. It's easy to make, although it proved to be a bit time consuming, but give it a couple hours and you'll have a lot of food to feed a hungry crowd (and the leftovers fare very well!). Onions, chiles, corn, Mexican soy crumbles, and tomatoes are cooked for the "filling." You'll probably want to heavily season this, as mine was a little bland on its own at first taste. I added salt, which worked, but the recipe does suggest also adding chili powder and/or cumin to taste. I think this is necessary! This filling gets poured into a casserole dish (I found a standard 9x13-inch to work the best), and is then topped with a cornbread batter. The cornbread is actually quite good, and probably would be fine served on its own. It's slightly sweet, very dense with a crunchy topping, and is even studded with chopped green onions and jalapeno. The dish is baked for about 45 minutes, but this left my cornbread topping just a little browner than I would have liked (the taste and texture were not affected); I'd try 40 minutes first. But in the end, you'll have a wonderful dish, guaranteed to keep you going back bite after bite. 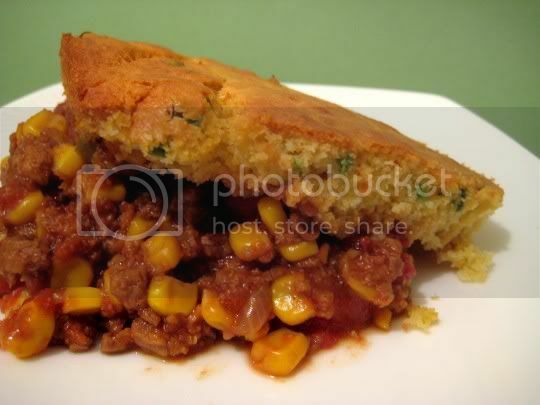 The cornbread is slightly crunchy and sweet, with the tanginess of the tomatoes, the sweetness of the corn, and the savoriness of the soy meat...this is a sure winner! Make again? Yes. Good Mexican comfort food.